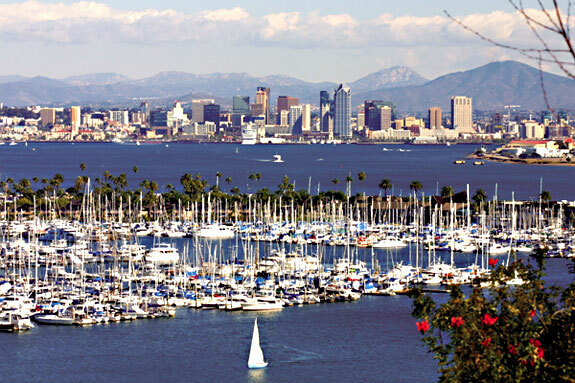 Point Loma is the gorgeous peninsula that welcomes ships and boats into San Diego’s magnificent harbor. 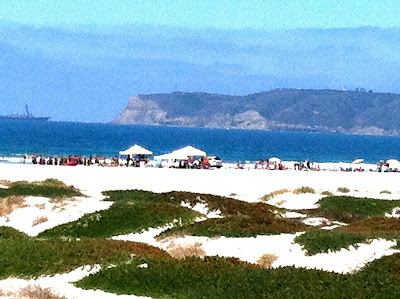 Atop this large peninsula sits Point Loma Nazarene University. I’m not sure if the amazing views from campus inspire or distract the students. The college commissioned me to paint this campus landmark of the cross with the ocean vista behind. It’s hard to imagine that paint could add to the natural beauty of this special place. 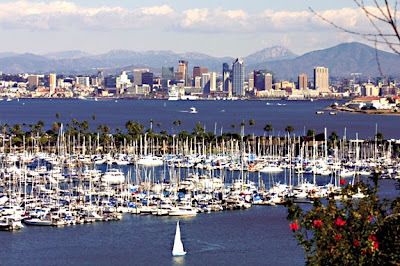 As a San Diego native, I have enjoyed visiting the coastal neighborhood of Point Loma. At the tip top of the point sits Cabrillo National Monument with AMAZING views of the harbor, city, ocean, and east into the mountains. As you drive to Cabrillo National Monument, you will pass Pt. Loma Nazarene University, and then through thousands of white crosses in Rosecrans National Cemetery (Military). At the park, you can visit the charming old lighthouse, the amazing tide pools (make sure to check the tide schedule online and go during low tide), hiking trails, and visitor center. My dear friend and college roommate, Gia, came for a visit with her family from Texas. We spent a great day in Pt. Loma. After working up an appetite exploring the tide pools, we headed back down the hill to Pt. Loma Seafood Co. to have a deli style fresh fish lunch...ordered it to go, and drove 5 minutes to Shelter Island, where we enjoyed a picnic. The kids played and we took in the view! RECIPE: Lobster on the grill! Point Loma Seafood is a great family owned seafood market that has been in San Diego for decades. Look in the lobster tank and take home a few live ones on dry ice, or to the beach for a lobster feast! 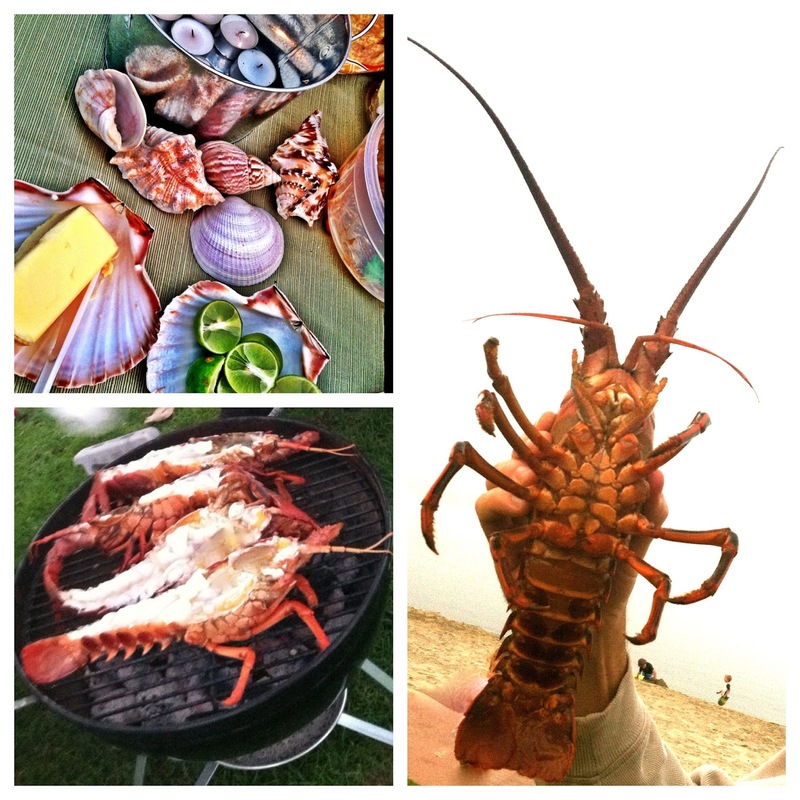 Our friends Paul and Sabrina, last summer treated us to grilled lobster at the beach. It was fantastic! The live spiny lobsters were brought to the beach on dry ice. The charcoal grills were warming up to full heat while Paul prepped the lobsters. With a large, sharp chef's knife, he cut them in half lengthwise (down the middle, separating right from left side). He removed the transparent tube-like intestine in the head, seasoned with salt and pepper, squirt of lemon, and a little butter on the tail. The lobsters were then cooked, shell side down on the grill. This keeps the meat moist, succulent and full of flavor. Cook 5-7 minutes, until shell turns light red and meat begins to pull away from the edges. The half lobsters are served with melted butter and lemon slices. DELICIOUS!